Our product range includes a wide range of wooden serving tray set. Special occasions need a special touch and this masterpiece is a perfect example of extravagance. 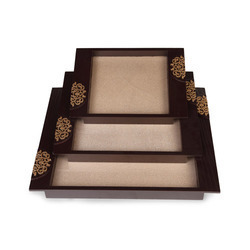 A rich and decadent serving tray that is an ideal way to serve and entertain guests during festivities and parties. An apt piece of serve ware to have in your kitty that adds an instant touch of luxury and class to your gatherings. Looking for Decorative Serving Trays ?